OK. 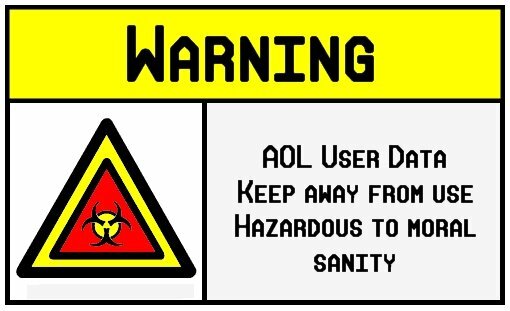 I took a look, a glance, a mere peek into the AOL user data. The data contents are massive. I secure-wiped the files from my drives. I shredded the CD-R media I had used to transfer the files from the desktop. I think I need to go visit the confessional tomorrow. Wow. Got some messed up stuff in 'dere. Poor folks. Now, granted, it wasn't all muck and stuff. There were quite a lot of "normal" search pattern queries. What was really freaky was how a user would be in the middle of a "normal" search run and suddenly go completely off into la-la land, then come back on track. And how the subject matter under a single (anonymized) account would show one type of search pattern at one time of day, and an entirely different one at another. Different users under the same login-name, perhaps? Address. Names. Locations. Subjects and particular activities. Sure hope all those things weren't related. I'd be worried if my name showed up in there. That's for sure. Some really freaky stuff, man. I really hope that some of the searches out there were just innocent queries by "aspiring" authors doing research for crime novels...God help us if they weren't. I am also beginning to wonder if the reason why Google didn't want to release its data to the DOJ wasn't so much as to protect search engine trade secrets and the like, but more to prevent fear, panic and the end of modern civilization and trust in the Internet as we know it if it ever got out. Bury the stuff deep within Yucca Mountain. Let the DOJ and other investigators do their jobs with the data--under a legally obtained warrant--and God Bless them for it. Feel like Captain Willard (Martin Sheen) coming back from dealing with Colonel Kurtz (Brando) in Apocalypse Now. Heart of Darkness stuff here. 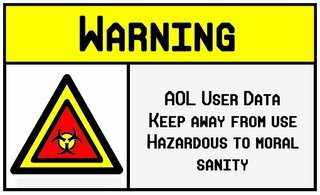 You've been warned. Don't think I'll talk about this subject again. In the Mood for Hot Coffee? Just Say It's So, Landis! I'm Mad about You, Baby!